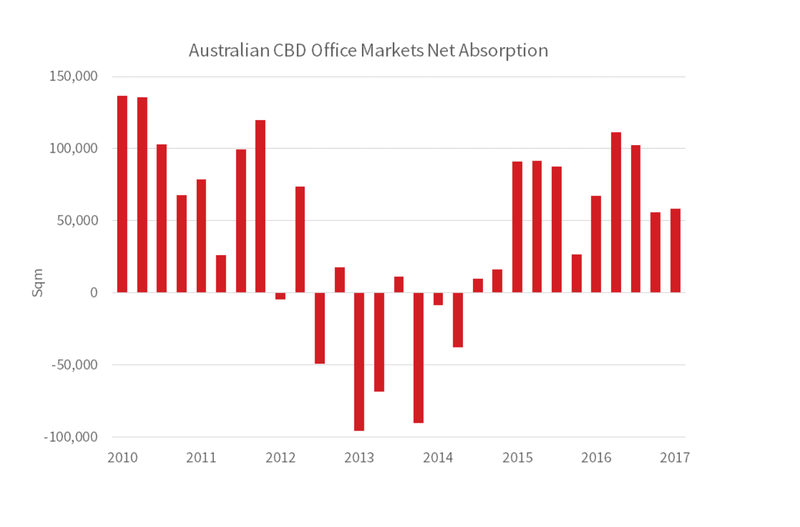 JLL's latest research into 2017's first quarter (1Q17) of the Australia's CBD office market revealed it has been a good start to the year for leasing markets nationally. The market produced a net absorption of 58,300 square metres over the first quarter of 2017 and 327,600 square metres over the past 12 months. The national CBD office market vacancy rate was reported at 11.4% in 1Q17 – a 1.0 percentage point reduction from 1Q16 (12.4%). JLL Head of Research Andrew Ballantyne said the office sector is a barometer of business confidence levels across corporate Australia. "Multiple reasons exist for optimism on the office leasing markets – economic growth is positive, a number of companies surpassed profit expectations in the half-yearly reporting season and job advertisement surveys have trended higher. “From a demand perspective, Melbourne is the standout performer with strong net absorption recorded," he said. "Sentiment has turned positive in the resource-dependent markets of Brisbane and Perth and we have seen tangible signs of recovery in both markets. "The Melbourne CBD recorded the strongest quarterly net absorption result in 1Q17 (+36,800 square metre) and vacancy compressed to 7.5% in 1Q17. Sydney and Melbourne sit at the top of global office market rent expectations in 2017. Rental growth was even stronger in the Sydney CBD with prime gross effective rents increasing by 7.3% in 1Q17 and by 22.6% over the past 12 months. Sydney CBD net absorption in 1Q17 (+2,200 sqm) was curtailed by a shortage of contiguous space. Vacancy trended lower to 7.3% and is now at very tight levels in the Core (5.9%), Midtown (3.6%) and South (1.4%) precincts. Furthermore, strong leasing enquiry and activity across the remaining space within International Towers Sydney at the Barangaroo South precinct will assist in pushing Sydney’s vacancy rate lower in 2017. “The strength of the NSW economy and the expansion of small to mid-sized organisations is supporting leasing market fundamentals in all Sydney office markets," JLL Head of Office Leasing Tim O’Connor said. Vacancy in the Sydney Fringe (3.3%), Parramatta (3.6%) and Sydney South (6.3%) are all tighter than the Sydney CBD. The vacancy rate in Parramatta is now at the lowest level since March 1990. The leasing market recovery in the Perth CBD gathered momentum with net absorption of 15,200 square metres recorded in 1Q17. The Perth CBD net absorption figure made it the second strongest CBD office market behind Melbourne. Vacancy tightened to 23.3% and the divergence between prime and secondary grade vacancy widened. “Higher commodity prices have positively impacted sentiment in the Perth CBD office market," Mr O’Connor said. The improvement in the Brisbane CBD leasing market continued into 1Q17, with a recorded 9,800 square metres of net absorption and a reduction in vacancy to 16.4%. Prime gross effective rents were flat in 1Q17 providing further evidence that Brisbane was at the trough of the rental cycle. “We are closely watching for a reversal in interstate migration trends and the affordability of Brisbane house prices relative to Sydney precipitating migration into SE Queensland," Mr O’Connor said. The Adelaide CBD recorded a modest correction in vacancy to 16.7% in 1Q17. The spread between prime (11.5%) and secondary grade (19.7%) widened further in 1Q17 as tenant demand was firmer for better quality assets. The Canberra office market vacancy rate was unchanged in 1Q17 at 11.7%. 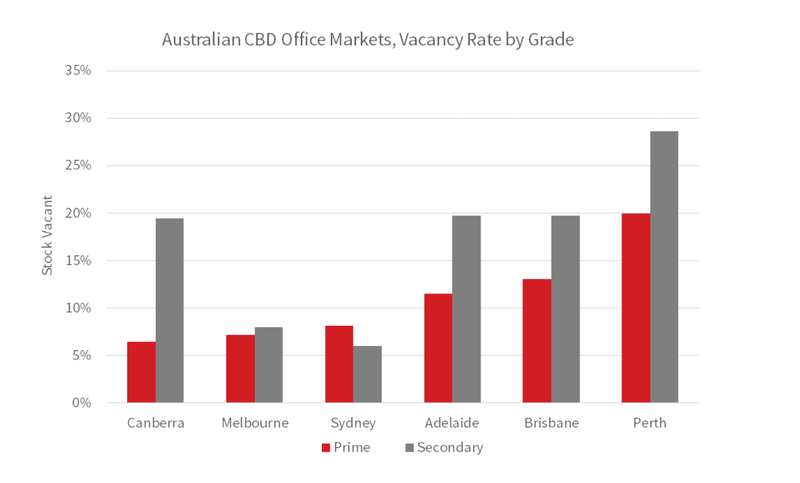 However, the prime grade vacancy is the lowest across CBD office markets at 6.4% – the lowest since 2Q08. Mr Ballantyne said that while Canberra does not experience the same rental volatility as Sydney / Melbourne, limited options in Civic and Barton is exerting upward pressure on rents. "Prime gross effective rents increased by 1.4% in 1Q17 and were up 2.4% over the past 12 months. “A shortage of contiguous space options in Sydney and Melbourne will lead to higher tenant retention rates over 2017 and 2018. 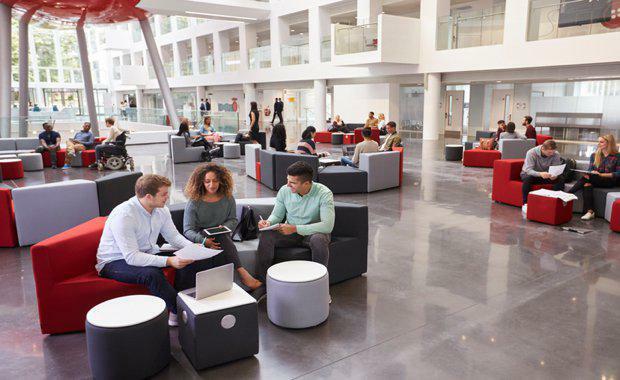 "Tenants will need to explore the potential for pre-commitment if they want to secure office space that supports the growth objectives of their organisation. “In Brisbane and Perth, landlords will be closely watching the improvement in leasing market activity to assess the depth and quality of enquiry, ultimately looking for opportunities to scale back incentives,” Mr Ballantyne said.